"No one's coming for us. Alyn, Jes, Ryan and Elsa are Nowhere. A concrete cube in the middle of a dense forest. Imprisoned inside are one hundred teenagers from all over the country. They're all criminals. But none of them remember committing any crimes. Who has put them there. What do their captors want? And how will they ever break free? 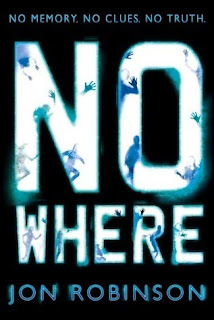 Nowhere was a disappointing read for me. I thought it would be good, judging from the blurb (yep - never doing that again!). It sounded tense and action packed and while it was - a bit. The lack of character development, made this book fall short of my expectations. Because there were so many POV's, and they kept switching, i felt i could never really connect with any of the characters and i hate that. I find that if i can't connect with the characters then i can't get into the book because i can't fully experience what they are experiencing and i can't feel how they feel. All the characters seemed to blend into one and although i really did enjoy bits of the story, i really don't think i will remember them. Or the characters...I was grateful that the book was short. Because it was a quick read I was able to read it in one night and i think if it had been longer then my expectations would have fallen even lower. In conclusion Nowhere is not a book i plan on reading again any time soon. It had bland characters and not much description and everything happened too fast...BUT. I think the ideal age range for this book is not mine. So let's hope the people who the book is aimed at love it! "A brave man is just a fool who gets lucky"
Nowhere had great potential. The blurb hints at great things but when you read it it feels a bit...flat. I've read so many amazing books in this genre and this one doesn't make the cut for me. It doesn't make you feel anything. It's a book you read. Then promptly forget. You weren't harsh! It's our job as book bloggers to be honest with our reviews and yours came out really well. Sorry you didn't enjoy the book very much! I liked the sound of this book, but I think I'll pass on it now. Sorry to hear that it was such a disappointment for you though. I hope your next read is more satisfying!